DURHAM, N.C. — Some habits are helpful, such as automatically washing your hands before a meal or driving the same route to work every day. They accomplish an important task while freeing up valuable brain space. But other habits — like eating a cookie every day after work — seem to stick around even when the outcomes aren't so good. Duke University neuroscientists have pinpointed a single type of neuron deep within the brain that serves as a "master controller" of habits. The team found that habit formation boosts the activity of this influential cell, and that shutting it down with a drug is enough to break habits in sugar-seeking mice. Though rare, this cell exerts its control through a web of connections to more populous cells that are known to drive habitual behavior. "This cell is a relatively rare cell but one that is very heavily connected to the main neurons that relay the outgoing message for this brain region," said Nicole Calakos, an associate professor of neurology and neurobiology at the Duke University Medical Center. "We find that this cell is a master controller of habitual behavior, and it appears to do this by re-orchestrating the message sent by the outgoing neurons." The findings, published Sept. 5 in eLife, may point towards new treatments for addiction or compulsive behavior in humans. The team got their first glimpse into the neurological underpinnings of habit in a 2016 study that explored how habits can leave enduring marks on the brain. The research was a collaborative effort between Calakos' lab and Henry Yin, an associate professor in Duke's department of psychology and neuroscience. The team trained otherwise healthy mice to receive a tasty treat every time they pressed a lever. Many mice developed a lever-pressing habit, continuing to press the lever even when it no longer dispensed treats, and despite having had an opportunity to eat all the treats they wanted beforehand. The team then compared the brain activity of mice who had developed a lever-pressing habit with those who hadn't. They focused on an area deep within the brain called the striatum, which contains two sets of neural pathways: a "go" pathway, which incites an action, and a "stop" pathway, which inhibits action. They found that both the go and stop pathways were stronger in habit-driven mice. Habit formation also shifted the relative timing of the two pathways, making the go pathway fire before the stop. In the current study, the team wanted to understand the circuitry that coordinates these various long lasting changes in the brain. They had a hunch that a single type of rare cell in the striatum called the fast-spiking interneuron (FSI) might serve as master conductor of the widespread changes in the outgoing neurons' activity. The FSI belongs to a class neurons responsible for relaying messages locally between other types of neurons in a particular brain region. Though FSIs make up about only one percent of the cells in the striatum, they grow long branch-like tendrils that link them up to the 95 percent of neurons that trigger the stop and go pathways. "We were trying to put these pieces of the puzzle into a mechanism," Calakos said. "And we thought because of the way that fast-spiking interneurons are connected up to the other cells, it could be the one cell that is driving these changes in all of them. That is what we set about testing." 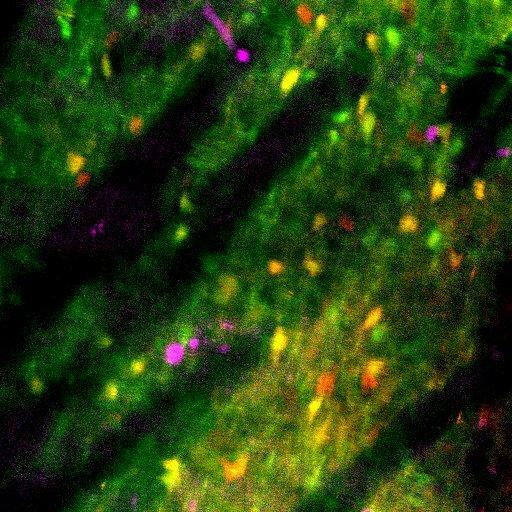 To test whether FSIs are truly the conductors of this cellular orchestra when it comes to habit, a graduate student in Calakos' lab, Justin O'Hare led the effort to take a closer look at the brain activity in lever-pressing mice. He found that forming a habit appeared to make the FSIs more excitable. He then gave the mice a drug that decreases the firing of FSIs, and found that the stop and go pathways reverted to their "pre-habit" brain activity patterns, and the habit behavior disappeared. "Some harmful behaviors like compulsion and addiction in humans might involve corruption of the normally adaptive habit-learning mechanisms." Calakos said, "Understanding the neurological mechanisms underlying our habits may inspire new ways to treat these conditions." "I firmly believe that to develop new therapies to help people, we need to understand how the brain normally works, and then compare it to what the 'broken' brain looks like," Calakos said. This research was supported by the National Institutes of Health (NS064577, ARRA supplement to NS064577, AA021075, GM008441-23, NS051156 and DA040701), the McKnight Foundation, The Brain and Behavior Foundation, The Tourette Association of America and the Ruth K. Broad Foundation.